Over on Freedom Central a few days ago I speculated that the First Minister's decision to reject school reorganisation proposals in the west of Cardiff might lead to some unhappiness amongst his Plaid Cymru allies. For my sins I was accused of petty and gleeful point scoring and yet my suggestion of disharmony amongst the coalition partners appears to be spot on. The Western Mail reports that 'Plaid Cymru figures heaped further criticism on the First Minister yesterday after the party’s National Executive Committee passed a no confidence motion in his rejection of plans to replace an English school with a Welsh one in part of Cardiff. Both Labour and Plaid Cymru were last night still trying to contain the fallout from the controversial decision, which stoked up fears within the latter about their coalition partners’ commitment to tackling the growing problem of surplus school places. In a statement, Plaid’s NEC said it had “no confidence” in a decision by Carwyn Jones to reject plans to modernise English-language provision and expand a Welsh-medium school in the Canton area of the city. Not only does former Plaid Cymru leader, Dafydd Wigley join in but so does his party's Chief Whip in the National Assembly. Chris Franks said the decision went against Assembly Government education policy. “I have no confidence in the decision taken by Carwyn Jones in respect of school reorganisation in the west of Cardiff,” he said. If this is not a crisis then what is? Rather foolishly I went away for the weekend having first written a series of posts to be published during my absence. One of these was on Freedom Central and celebrated the fact that the Thirsk and Malton delayed election indicated that the coalition government was still in its honeymoon period. Of course within hours of my arrival at Hay-on-Wye the first indications of the Telegraph story on David Laws hit Twitter and it no longer felt like any sort of honeymoon. For the record I do not believe that David Laws had any choice but to resign as it seems that his claims are clearly in breach of the rules. However, it is also apparent that this was a misjudgement on his part rather than blatant dishonesty as if he had followed the rules to the letter he would have actually have been able to claim more than he did. Within 24 hours of Danny Alexander being appointed to succeed David Laws as Chief Secretary to the Treasury the Telegraph was off again making allegations about his tax affairs that turned out to be not only misleading but untrue. I am told that they are also rooting about i the affairs of other Liberal Democrat MPs. It is not for me to criticise the proper scrutiny of government ministers by the media but it does appear as if the Daily Telegraph has taken upon itself the role of judge, jury and executioner, picking its victims at will and using whatever means it can to undermine them. I would love to publicly announce who I am voting for in the Liberal Democrat Deputy Leadership contest but apparently I do not have a vote. The electorate is an exclusive one. It is the 57 MPs and that is it. Therefore campaigning activity is likely to be limited. This is despite the fact that the role is absolutely crucial in liaising between the Government, the rest of the Parliamentary Party and the party at large. A job that cannot be done by the Party President alone. If I had a vote I would be backing Simon Hughes. I think it is a disgrace that he has been overlooked for a government post and yet despite that he has been loyal to an extreme. Not only did he deliver a barn-storming speech to the special party conference that overwhelmingly endorsed the coalition but in the first week he appeared on programme after programme robustly defending the deal against some very abusive comments. He has also been Party President and is widely respected and liked throughout the party both for his principles and his commitment. It seems to me that he is the ideal successor to Vince Cable in these changed times. Personally, I am spending the weekend at the Hay Literary Festival but according to this article in the Telegraph, many others may be spending large chunks of the bank holiday period in traffic jams. The paper says that up to a million more travellers will get behind the wheel than last year due to uncertainty over the BA strike and the effects of the ash cloud from Iceland, which has deterred many people from taking foreign holidays. According to the AA routes to south west England will be particularly busy, with vehicle numbers being swelled by caravan owners trying to get away for the weekend. Congestion is also expected to be severe on roads to national parks and major out of town shopping centres. Traffic is likely to be heaviest on Friday when ordinary commuter traffic leaving city centres coincides with millions of motorists trying to get away for the weekend, despite forecasts of gloomy weather. As if to add insult to injury Network Rail plan to carry out maintenance work as well. I just hope that the weather holds up. Former Home Secretary, David Blunkett showed yesterday what a sore loser he really is when he threatened to sue the Government for the £30 cost of his ID card. He is upset that holders of the documents will not be compensated when they are abolished. He is still under the illusion that these cards will make a difference to National Security or to the fight against crime despite all the evidence to the contrary. It is a useful indication that whoever wins the Labour leadership contest is going to have a long fight to reform that party so as to put them into a position to take the reins of power again. Just in case anybody doubts that the Liberal Democrats got a lot of what they wanted out of the UK coalition then two articles in this morning's Times should help. Mr Cameron’s belief that the 148 newly elected Tory MPs owe him a debt of loyalty took another blow when they helped to elect three other well-known rebels to key posts on the committee, set up to defend backbenchers after the failed Conservative coalition with the Liberals under Lloyd George. Christopher Chope, MP for Christchurch, and Charles Walker, MP for Broxbourne, were elected. Both have spoken out against proposals to require an “enhanced majority” of 55 per cent to dissolve Parliament. Mark Pritchard, MP for The Wrekin, a critic of Mr Cameron, beat Nicholas Soames and Peter Bottomley, Conservative grandees on the Left of the party. The ballot provides an early indication that Tory MPs are determined not to be marginalised by a coalition Government that has a majority of more than 70. Meanwhile Liberal Democrat plans to rebalance the tax system are causing some concern in Tory ranks. The paper says that there are signs of a rebellion among high-earning Tory supporters preparing for a fire sale of shares and second homes because they are worried about changes to capital gains tax. They add that the Chancellor is now holding discussions with Tory critics, signalling that he is prepared to negotiate a compromise. He is understood to be looking at a range of options, from minimising the rise to restricting the scope of tax so that it hits fewer people. But Mr Osborne must still raise enough cash to satisfy Liberal Democrats that there has been progress on their signature plan for a tax break for lower and middle earners, due next April. All of this is of course very interesting but it does not mean that the coalition is being blown off course, just that there is a period of discussion and internal adjustment that happens in any new government. It also underlines the fact that this is neither a Conservative nor a Liberal Democrat government but a genuine partnership, contrary to the rabid rhetoric of Labour and Plaid Cymru. This morning's Guardian confirms that the £4.5bn national identity card scheme is to be scrapped within 100 days. They say that abolishing the cards and associated register will be the first piece of legislation introduced to parliament by the new government. The identity documents bill will invalidate all existing cards and the role of the identity commissioner, created in an effort to prevent data blunders and leaks, will be abolished. This move is set to save £86m over four years and avoid £800m in costs over the next 10 years that would have been raised by increased charges. The paper adds that an allied decision to cancel the next generation of biometric fingerprint passports will save a further £134m over four years. Savings to the public under the whole package will total £1bn. Brendan Barber of the Trades Union Congress also welcomed the decision: "Scrapping identity cards is an important sign that the new government is committed to safeguarding civil liberties. Who should be the next Chair of the Welsh Affairs Select Committee? Peter Black: Minister, would it be possible to have an urgent statement from the Minister for Rural Affairs on the way in which the Government is implementing the cull of badgers in north Pembrokeshire? You will be aware from newspaper reports that there has been great consternation in the area about Assembly contractors going around the countryside wearing masks, accompanied, mob-handed, by large numbers of police officers, thereby intimidating residents. In response to that, the Minister claimed that landowners had been notified in advance of visits by Assembly Government staff and their contractors, when, in fact, although landowners are told that there will be visits, they are not told when they will happen. In some instances, female pensioners who live alone have had to insist on being given a date. Last Tuesday, a disabled gentleman in his 80s, in a wheelchair and losing his memory, was alone when he was visited by masked contractors and a police van full of police officers. He was left shaken and visibly shaking as a result of that visit. You will also know from having watched the videos of those visits that the Minister’s claims that the contractors are wearing masks because of attempts to intimidate them are clearly not true. On a number of occasions, the contractors have gone around wearing the masks even though there were no cameras present or demonstrations taking place. I have mentioned the example of the gentleman in his wheelchair; another is that, earlier this week, a couple were stopped at the top of their drive by police officers and masked men, who were apparently Welsh Assembly Government employees, when that drive leads to only two cottages and a holding that had already been inspected for badger setts. There are also concerns about the methods being used by contractors who are not prepared to allow their identity to be verified before going onto people’s land, and about the fact that, in some instances, proper biosecurity measures have not been taken by the contractors in pursuing their duties. It seems that all the trappings of a police state have been put in place in north Pembrokeshire by the Assembly Government. It is urgent that the Minister for Rural Affairs answers questions on the regime that she has put in place, how she is implementing this cull and how she will deal with some of the concerns raised by residents in this regard. Jane Hutt: As you said, the Minister has responded to these issues. They are being addressed and handled in the preparatory stages of the pilot that is being undertaken. I am sure that she will want to put the record straight on any issues that have been raised in the Chamber today. Lorraine Barrett: Minister, I would like to support what Peter Black has said and ask you for a statement in the Chamber to update us on the current survey of badger setts in north Pembrokeshire. I, too, have seen video footage of men in balaclavas turning up to undertake the surveys, but who are not prepared to show the landowners and residents any photographic evidence of who they are. While they were accompanied by an official—who, I presume, was a Government official—and police officers to verify that they were who they said they were, there were many distressed and emotional people, quite a few of whom were quite elderly, and Peter has given us some examples. You have said that the Minister has replied, and I have seen that in the press, but her officials describe the objectors as a tiny minority, but they are not. There are at least a couple of hundred, and many who have not made themselves known because they are living on their own in isolated areas and are a bit nervous. I just wanted to say that it is intimidating to have men in balaclavas turning up at your gate, supported by police vehicles, waiting to gain access when you have had a day’s notice, or perhaps less than that. Jane Hutt: I refer you the response that I gave to Peter Black earlier in answer to his questions. The Minister will be aware of the issues that have been raised today in the Chamber. Yesterday's announcement by David Cameron in the House of Commons that a referendum will not be held in Wales on more powers for the Welsh Assembly took us all by surprise. The one criticism I have of the Prime Minister is that he made this announcement without first ensuring that there had been full discussion with the Welsh Government. That was naive and a sign of inexperience in the job. I hope that he is a bit more sure-footed in future dealings with Wales. I have already written here that in many ways the date of the referendum does not matter, provided that it has taken place before the Assembly elections in May 2011. That is because we will not be in a position to properly use these new powers until the fourth Assembly takes its seats. Nevertheless, my preference and that of the Welsh Liberal Democrats is for an autumn referendum, if that is possible. And that is the $64,000 question. It seems that so little preparatory work was done by the previous government that it will take a superhuman effort and some cutting of corners to achieve that date. Is that desirable or wise? I do not know. On Radio Wales this morning Plaid Cymru's Deputy Leader argued that the staging of an autumn plebiscite should be an absolute priority for the Secretary of State for Wales. That is a fairly blinkered view of the job. After all should she not also be concerned with rising unemployment levels here, the growing poverty gap and the need to press for an early Calman-style Commission for Wales? There is a real danger that the Welsh Government, in their desire to score political points are failing to see the woods for the trees. Just in case anybody thinks I have a complete downer on Plaid Cymru and their crazy ideas I thought it might be worth mentioning the entirely sensible comments of former Welsh Minister, Rhodri Glyn Thomas in this morning's Western Mail. “We’re into a new era, and it’s the responsibility of us as politicians to decide what the spending priorities should be at the Assembly. Mr Thomas said it would be wrong to exclude the health and education budgets from cuts. “Obviously there has been a commitment to safeguard frontline spending on health and schools, but I believe there is still a lot of scope even within the health and education to tackle waste,” he said. “It was completely ridiculous, for example, to reorganise the NHS in Wales nine years ago creating 22 local health boards. That meant 22 chief executives, 22 finance directors and 22 medical directors. “All that happened was that in many cases middle managers were over-promoted into jobs with salaries of £100,000 and more. “The original error was compounded when the reorganisation was reversed and senior managers were allowed to stay on with their big salaries, even though their jobs had disappeared. I am not sure that his former Cabinet colleagues will be that pleased to read his comments. Welsh Government Deputy Minister for Children, Huw Lewis appears in this morning's Western Mail describing the decision to scrap Child Trust funds as 'evil'. Huw may disagree with the decision but even he must at some stage regret the language that he is using to respond to it. After all if a policy decision such as this is 'evil' then what term will we use to describe child abuse or some of the other evils that exist in the World? How do we describe the failure of the Labour Government over the last 13 years to reach their own targets on child poverty, a period during which we have gone backwards? In the chamber this afternoon Labour members have claimed that the abolition of the fund will condemn countless Welsh children to a life of poverty. How they came to this conclusion is difficult to ascertain. After all we are talking about £250 put in a savings account that cannot be accessed for 18 years, by which time it will have lost all its value. Surely that money could be better spent on early year's education so as to give children a real start in life that offers them opportunities and skills to succeed. I have just asked the First Minister again on the issue of long-term empty homes around Wales. Shelter Cymru estimate that there are 26,000 such properties in the private sector, whilst the Government's own statistics put the figure at 21,000. I am pleased that the Deputy Minister for Housing has now adopted the Welsh Liberal Democrat policy of offering Councils the choice of imposing higher Council Tax on these properties so as to compensate the community for the blight that they have had to suffer, though she did not give us credit for the idea when she last spoke on the matter in the chamber. However, this does not amount to a strategy to bring these houses back into use as affordable homes and when the First Minister responded to my question all he had to say on the matter was that the present economic climate made it difficult to do anything. This is complete nonsense. It is possible to implement a carrot and stick policy to bring homes back into use within existing budgets. However, the Welsh Government remains clueless on this issue and apparently are unwilling to listen to suggestions as to how to move this agenda forward. I can often be found muttering to myself about what passes for news nowadays and today was no exception. The source of my frustration was this article in today's Western Mail. In it Plaid Cymru MP, Hywel Williams accuses the Westminster coalition Government of failing to understand and respect devolution following the suspension of Home Information Packs (HIPs). He claims that Ministers have a duty to consult the Welsh Government about matters concerning residential accommodation in Wales and had failed to do so. Really? What may have escaped Mr. Williams' notice is that this particular aspect of housing legislation is not devolved to Wales. Why then should a Welsh Minster exercise any sort of veto on this issue? Furthermore, why is Mr. Williams defending HIPs? They are expensive, overly bureaucratic and cumbersome. The only good part was the Energy Performance Certificates. The Government is keeping these and making them more relevant so as to help buyers make informed decisions on the energy costs of their new home. It is becoming a tradition in this country that at some stage in a general election campaign some newspaper will dress somebody up as a giant animal or bird (normally a chicken) and then send them to follow one of the poliical leaders around the country. Sometimes the perpetrator is one of the other political parties. It can be an effective tactic as Republican candidate, Sue Lowden has found out to her cost in Nevada. According to this site she suggested that people who are too poor for medical care could offer chickens to their doctors in lieu of payment. As a result she has suffered weeks of ridicule including the Democrats setting up a website, "Chickens for Checkups," and sending volunteers in chicken suits to her campaign events. State election officials have responded by adding chicken suits to the list of banned items at polling places. 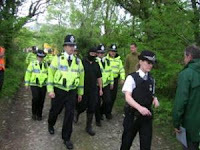 The Welsh Assembly Government claim that arrests were made because animal rights activists are intimidating officials. This film shows that landowners are being arrested for insisting that legal procedures are carried out. One other question, did all of those officials and police officers disinfect their footware before entering onto the land? How concerned is this possé with biosecurity? I understand that those people arrested were later released without charge. The Welsh Language Society held a rally outside the Senedd this morning to protest against the inadequacy of the Welsh Language Measure. I was not able to be there but I fully sympathise with the points that they make and we will no doubt be seeking to amend it in due course. Firstly, I believe there’s a need for a clearer and less ambiguous clause in the measure regarding establishing official status for the Welsh language. “Secondly, I believe there needs to be further consideration of how the Commissioner is appointed and to ensure that the independence of the Commissioner can’t be compromised. All of these are entirely valid and no doubt will be picked up in the report of the Legislation Committee when it comes out. Hopefully, the Plaid Cymru Heritage Minister will be sympathetic to these views and will accept amendments accordingly. I would hate to see party colleagues at odds with each other over such a key article of Plaid Cymru faith. I must confess that I laughed out loud when I read in this article in today's Daily Telegraph that Jeremy Hunt, the new Culture Minister, has been accused of attempting to rewrite history by deleting pre-election tweets critical of Nick Clegg and the Liberal Democrats. I mean it is nice of him to care, but really, there was no need. The paper says that messages mocking the Liberal Democrat's alleged "shameless" U-turns on the euro and an immigrant amnesty were among the dozens of posts now deleted by Mr Hunt, whose Cabinet role includes responsibility for the internet. They say that in one tweet now consigned to the cyber-dustbin, he derided Mr Clegg's discussion of morality during the second leaders' debate. They report a spokeswoman for the minister denying there was any attempt to airbrush the past. Yeah, right! All of the South West Surrey MP's campaign tweets have now been deleted because his ministerial role represents "a new chapter and we are starting afresh", she said. The spokeswoman added: "They were pre-government and we are now tweeting post-government. He is going to carry on tweeting, and his updates will appear on the DCMS website." She confirmed that Mr Hunt updated his Twitter account personally, and would continue to do so. He has more than 3,000 followers. For the record, I have no interest in what Mr. Hunt said prior to the coalition. I have no intention of trying to rewrite my own Twitter history or my blog just because we are now in coalition with the Tories. More importantly, we now have to take decisions in government. The country is in the middle of an economic crisis and sorting that out must be the first priority. People's jobs and livelihood depend on us getting this right. We are also in coalition and that entails compromise. That means that even some of our aspirations and policies need to be put on the back-burner whilst we deal with the current situation. Everybody understands the context in which these things were written and that things have now moved on. There is therefore no point in trying to rewrite history at all. We all say things in the heat of the moment that we would want to take back later or which might embarrass us in the future. C'est la vie. Kudos to Jeremy Hunt though for tweeting in person. Long may he continue. I may even start reading his tweets. The First Minster has just issued a statement on the referendum. In it he says that he has written to the Secretary of State for Wales to claim that it is his understanding that the drafting work on the Order in Council to be laid before Parliament will have been substantially completed by the end of this month. Do you want the Assembly to have the power now to pass laws on all the subjects which are devolved to Wales? He then goes on to say that the Welsh Government have expressed a strong preference for a referendum to be held in late October of this year. In many ways this is helpful, however the timetable he has laid down appears to be unworkable simply because the preparatory work he refers to has not been done. The Electoral Commission says that it needs ten weeks to consult on the question and the order cannot be laid until this is resolved. This means that realistically it now looks as if the referendum will be held early in the new year. Perhaps if the Welsh Government had been this proactive immediately after the Assembly passed the motion in February we would be in a better place. Equally, if the previous Secretary of State had not shelved the proposal until after the General Election an October referendum might have been possible. It seems to me that it does not matter whether this referendum is held in October or later providing that it is held before the Assembly elections and not on the election day. After all, whether it is held in the autumn or early 2011 we will not practically be in a position to use any of the powers until after a new Assembly is elected. I am in and out of committees all day so I have not had a chance to absorb all the details of the full coalition agreement. However, on first glance there seems to be some tangible benefits specifically for Wales, in addition to the reforms and actions that are planned to put the economy onto a firm footing and to create a more liberal constitution. This is an extensive and detailed reform agenda that puts national interest before party. Deficit reduction remains at the heart of everything. This government will deliver fairer taxes for the people of Wales, with significant increase in the personal allowance in the fisrt budget. We will also see the restoration of fairer pensions. On the Referendum – We want this to happen at the earliest opportunity. Labour failed to deliver this and we have now seen that no real preparatory work was done on the question. We will be campaigning on a yes vote. We know the Deputy Prime Minster is committed to this and will come and campaign. We strongly hope to see the Prime Minister doing the same. The Housing LCO was held up by the Tories, it should never have been lost in the wash up. This contains important Liberal Democrat policy and we are delighted to have revived a legitimate request by the Assembly for more powers. The commitment to a Calman style commission for Wales is a key commitment of the Treasury to take this work forward. It does not rule out changing the way Wales is funded but places deficit reduction before everything. A mess that Labour created. This commitment takes us beyond where Plaid and Labour have envisaged us being and moves us on past their style of begging bowl nationalism. It will look at tax-varying powers and greater financial accountability for Wales. Labour have had 13 years to deliver fair funding for Wales and didn’t. Unlike them, we have been able to secure UK government commitment and involvement which will go well beyond the motivation of simply reforming the funding system but promise real change for the next generation. On electrification of the railways - there is support in this document for further electrification but no specific commitments. This is probably as much as we are going to get at this stage! Yesterday, Welsh Assembly representatives attended land near Newport to survey for badger setts as part of the cull process. I happened to be present as the occupier of the land in question grows crops for me under contract. Representatives from the WA were Mr X and two other men dressed all in black with balaclavas entirely covering their faces except for their eyes. These masked men offered photo-id cards that bore no name, but refused to take off their face coverings to check against the id photo. While a person returned to the farmhouse to call the WA to ask how they could possibly check a photo id in this case, the WA representatives attempted to force their way through a gate onto the land. Two of the occupiers said they would not allow them access until the reply was received from the WA - on grounds that the men in black balaclavas were not identifiable. At this point these two occupiers were arrested for obstruction. It should be noted that they were released without any charge whatsoever, showing that they were in fact being reasonable in their actions. The point of my letter is that in a subsequent interview, Mr X, filmed by national media, confirmed that when the contractors returned to shoot the badgers, they would still be masked. When pressed on this point, he confirmed - on film - that this meant the WA would be sending masked men with guns onto the land at night. This is incredible. The legal, human rights, public security and safety issues are immense. I cannot believe this can possibly have been the intent of the WA in passing this legislation. I am asking you if you support the deployment of masked armed contractors, and if not, will you please bring pressure to bear on the WA to find an alternative solution. Since the 30th of April 2009 the number of herds under TB restriction in Wales has fallen dramatically. When March, and April figures (2010) are factored in, it is likely they will show that during the last 12 months, the number of Herds under TB restriction in Wales will have fallen by 50%. This has been achieved without a badger cull and only limited cattle measures i.e. more testing and slaughter of infected cattle. There are still a total of 702 TB tests overdue which is really quite inexcusable when the WAG proclaims to be doing all it can to deal with this disease. If considerable time, manpower and expense had not been wasted in extensive preparations for a totally irrelevant badger cull this disease would be on the way to being eliminated from Wales or at least being reduced to a very low and insignificant level. The WAG often refer to the number of farms and landowners, (more than 10%) who are refusing to co-operate with the badger cull as being small, a handful, trivial or insignificant! Whereas I seem to remember the WAG arguing that 6-9% was a figure that was ‘substantial’. Are the Government's TB control measures starting to come apart at the seams? The Western Telegraph gives a good indication of the sort of tensions that are being generated in North Pembrokeshire by the decision of the Labour-Plaid Cymru Government to carry out a cull of badgers there. Police have confirmed that two men were arrested under articles five and six of the Tuberculosis Eradication (Wales) order 2009. The act states that an authorised Welsh Assembly Government officer may enter any premises, apart from a domestic dwelling, to treat badgers and that the occupier of the land must comply. Article six states that it is an offence to obstruct or interfere with anything being done or used in connection with the treatment or destruction of badgers. Police said a third man has been arrested for theft. I have been told by campaigners in Pembrokeshire that the Welsh Government's contractors were wearing balaclavas and sunglasses. My contact tells me that the person who was arrested for theft was in fact released without charge as all he was doing was holding the photocards presented to him as identification by the contractors. My contact poses the question as to how exactly one is supposed to verify identity when the contractors have covered their faces. They say that the landowner merely wanted to go and phone the telephone number on the ID cards as the Welsh Government procedure states they are advised to do. Instead he was arrested to prevent him doing this leaving just his elderly parents, one of them very sick, to cope. I am also told that contractors have been turning up completely unannounced, with their faces obscured, often terrifying people, especially those living on their own or whom are elderly and vulnerable. "Our main aim is to lawfully carry out this work to identify where badger setts are in the area. Bovine TB is a crisis we have to deal with and we need to co-ordinate activity effectively." "It has been made clear from the outset that the identity of contractors would not be put in the public domain. Clearly today the contractors tried to protect their identity because of their concern about the situation and level of personal intimidation. They felt that that their identity was not being respected by the media and individuals." Surely there is a difference between not publishing the identity of contractors and allowing them to turn up on people's doorsteps mob-handed and hiding behind disguises. Surely, contractors and the police should be allowing landowners to check the identity of those coming onto their land in accordance with government guidance rather than behaving in what appears to be an unacceptable way. As it is, if these reports are correct, it appears that the methods being utilised are creating a siege mentality in some parts of this area of Wales. If there is personal intimidation of contractors as the Government allege then they should provide proof. All we have seen so far is the landowners themselves feeling intimidated by the way that the Government is going about this cull. An attempted badger survey sparked an eight hour protest as Cilgwyn residents questioned the Welsh Assembly Government's right to enter their land. Residents of Brithdir Mawr and Tir Ysbrydol alleged they had not been properly notified that officials were to enter their land, and they were unable to check the identity of the men because they were wearing black masks. Around six police vans and cars full of officers were at the scene during the protest which lasted from 10am to 6pm. Resident Emma Orbach said: "It's disgusting, this is totally without our permission. "We have a history in this valley and we do not give up." The masked men were finally escorted onto the land by police, while residents chanted "shame on you! ", but left soon afterwards due to technical issues. Officals said they would notify residents before their next visit. Resident Felicia Ruperti said: "We will still protest when they come back. "I felt very intimidated by the amount of police here today. We have been peaceful from the start and have not threatened anyone." Surely the Rural Affairs Minister can see the damage she is doing with these heavy-handed tactics. It is the case in all political parties and governments that policy and decisions are often born of compromises following full and frank discussion and the occasional bust-up. In many cases such disagreements are contained within the party hierarchy and only whispers of dissent reach the outside world. In the case of a full-blown coalition there are more difficult dynamics at work which, when coupled with outside interests seeking to exploit known differences in philosophy and policy, can prove problematic. In other words we are going to get a split story every week or more often than that depending on what the current fad is. This is particularly prevalent at the moment as the two parties put the finishing touches to the full partnership document and the Queen's speech. The fact that Gordon Brown went so quickly after it became clear Labour were not serious about a progressive alliance, assuming such a concept was workable in the first place, meant that negotiators did not have time to complete their work. This means that the more difficult stuff is on-going. This morning's Independent captures a flavour of this work with a story about discussions on the Human Rights Act. They also refer to sentencing and prison reform, capital gains tax, social care, fox-hunting and the banks. All of these are in the mix. We can expect many more of these stories in the months and years to come but we should be relaxed about that. This is not a single party government, it is a coalition and as such we should expect greater discussion and negotiation on each issue as well as more obvious compromise on each side. We will not win on every issue and no doubt there will be red lines that some activists have drawn on which their continuing membership and support for a particular party rests. Nobody said government would be easy. Working with another party is harder still. What matters is that the agreement we have drawn up is delivered and that the swathes of Liberal Democrat policy accepted by the Conservatives is put onto the statute book. We must not let this project be blown off-course by the storms that lie ahead. Conservative Assembly Member, David Melding has an interesting and thoughtful contribution to the debate around the new Coalition Government over on the Institute of Welsh Affairs blog that is well worth reading. He continues: 'Would the Lib Dems have lost most of their appeal as a party of the centre left under all of these circumstances? Those who expect or wish for this outcome should consider the following points. The Lib Dems are set to become a party of government at the UK level. Already their cabinet members look the part and any accusation that they are bearded, sandaled dreamers is patently risible. Yes they will lose some of their purists to the Greens, but they will also pick up support from the steady middle of politics. Todays Times alleges that the outgoing Labour Government embarked on a scorched earth policy in relation to the nation's finances on a scale not seen since Napoleon retreated from Moscow. OK, that may be an exaggeration but still it is still pretty serious. The paper says that Ministers have discovered Whitehall “black holes” that could force even more severe public spending cuts, or higher tax rises than previously thought. They allege that billions of pounds in public money was committed in the run-up to the election campaign in a deliberate strategy to boost Labour’s chances at the ballot box and sabotage the next government. All-in-all even if only half of this is true it is a pretty depressing picture and one that means that hard decision will have to be made in the coming months. Update: the BBC report the comments of Civil service union leader Jonathan Baume who they say told 5 Live's Chief Political Correspondent John Pienaar that civil service chiefs lodged formal protests at spending decisions by Labour ministers in the dying months of their rule. He said that it culminated in the "nuclear option" of demanding written - and soon to be published - instructions from their political masters. Laws revealed the contents of the letter at a press conference today, telling reporters: "When I arrived at my desk on the very first day as chief secretary, I found a letter from the previous chief secretary to give me some advice, I assumed, on how I conduct myself over the months ahead. Mr. Byrne claims that the note was a joke and no doubt that was the intention. However sometimes, as in this case, wry remarks can reveal deeper truths. Labour really has left the country near to bankruptcy. Over recent decades the party’s strategy has been built on offering themselves as the alternative to whichever of the two “old” parties is strongest locally, and encouraging tactical voting accordingly. This has produced some striking successes. Parliamentary by-election gains have not always proved enduring, but the oxygen of publicity has been invaluable. In 1994, the victory over the Tories in Eastleigh — which Chris Huhne retained with an increased majority this month — confirmed that the skids were under John Major’s government. Sarah Teather’s victory against Labour in Brent East in 2003 reinforced public opposition to the Iraq war and temporarily propelled the Lib Dems to equality with their rivals in the polls. Historically the Lib Dems have done better in such contests against unpopular Tory rather than Labour governments. Labour voters react to adversity by staying at home; Tories are more likely to cast a protest, but without going the whole hog and supporting the traditional enemy. With the Lib Dems now in government, they can no longer pose as the natural home for mid-term malcontents. Worse they may even be forgotten. By-elections in this parliament are unlikely to see voters flooding their way: opportunities instead being opened up to parties such as the Greens, the British National party and UKIP which, with the exception of Caroline Lucas’s result in Brighton Pavilion, were squeezed 10 days ago by the televised debates and the focus on the three main players. The article goes on to discuss the impact of being in government on the Liberal Democrats' council base and our grass roots. Nobody said it would be easy. However, we have had some experience of being in government and the impact that can have on our community represention both in Wales and Scotland. We have also run and defended our control of many Councils. The Liberal Democrats have had to adapt and change our tactics before and we will do so again. Promoting our achievements and defending a record is a different ball game to being in opposition at any level. Still it does give pause for thought and the issue will no doubt occupy much time in the months ahead. It is not often that I quote Welsh Ramblings on this blog (and indeed I am going to ignore the less comfortable and inconvenient parts of his post so as to make my point) but he really has hit the nail on the head today over Labour's hypocritical indignation regarding the Conservative-Liberal Democrat coalition government in Westminster. He says: there is an immediate sense that Labour are getting carried away with their attacks on the new liberal conservative coalition. They have immediately gone to the barricades, cementing their false "anti-cuts" narrative. Whether they're talking about delaying cuts for a while or bringing them in straight away, all of the mainstream parties are expecting ordinary people to pay for the banking crisis. Just as Labour MPs were perceived to have been hungry for opposition, their behaviour has immediately turned to mealy-mouthed tweets and red-flag rhetoric. I am all for that, except Labour does not have a leg to stand on. Their 13 year tenure in office was simply not progressive, centre-left (let alone "socialist"), or particularly virtuous. It shouldn't be forgotten that Labour presided over a Thatcherite economic policy based on an unsustainable credit boom, an over-reliance on financial services and cutbacks to the state and its ability to protect people from market failure (which indeed happened) and to deliver services. How many pensions were lost? How many assets sold off? How many strikes? That's without mentioning Labour's positioning of the UK as a partner in illegal wars, in condoning the use of torture and in facilitating the global arms trade, despite the tokenistic ban on cluster bombs. There's only so many times tax credits and the minimum wage can be wheeled out by a government responsible for the deaths of perhaps hundreds of thousands of people in Iraq and Afghanistan and for effectively allowing a generation of people to face long-term unemployment, whilst having the nerve to claim they were following a "Keynesian" economic policy. The ugly truth is that as far as democratic reform goes, the Tory-Lib Dem government is offering a more progressive platform than Labour did. AV is a sell-out for the Liberal Democrats, who should have held out for the use of STV- AV scarcely represents "real change". But AV was a Labour idea in the first place. Labour put AV on the agenda and must bear some of the responsibility for it being floated as a policy to deny genuine proportionality from being attained. On ID cards and civil liberties there is simply no question that the Lib Dems and Tories have both been consistently more progressive than New Labour. Labour's insistence on pursuing detention without trial, surveillance and an abuse of authority has opened up the state to accusations of being sinister or prying, exposing the undeserving public sector to the prospect of an outright assault. Today's Special Liberal Democrat Conference in Birmingham was a positive and affirming experience. I have seen estimates of 2,000 members present for over four hours of high quality debate. This was no rally. Many members had doubts, some expressed them and one or two spoke against. But the mood was positive and supportive and the vote at the end overwhelming. I tweeted throughout as did many others. These can be read by searching the hashtag #ldconf. However, what puzzled me and many others was why the Conference was held behind closed doors. This was a mature and considered debate. It was a credit to the party and yet we missed the opportunity to project that to the outside world and to give others a better understanding of why we had entered into the coalition agreement. Instead some press officer got the wobbles and sought to tuck the debate out of harms way. It was not a good decision. A special Conference this afternoon in the huge Birmingham National Exhibition Centre will give Liberal Democrat members the opportunity to have their say on the new coalition agreement. My understanding is that work on the detailed policy agreement is still on-going and that what has been published so far is a headline document. That is because there was insufficient time to complete the deal before Gordon Brown went to the Palace to tender his resignation. 1. Raising the tax threshold to £10,000, taking hundreds of thousands of people out of tax altogether, an important contribution to the agenda of tackling poverty. Under Labour in Westminster and Labour-Plaid in Cardiff Bay we have actually gone backwards in that fight with rising unemployment figures and a widening gap between rich and poor. 2. More money for education targeted at the poorest pupils. In contrast Labour and Plaid in Cardiff Bay have let education wither on vine, cutting the money available for school buildings and underfunding local Councils. We have also guaranteed year-on-year real term increases in NHS funding meaning that Labour and Plaid claims about the impact of cuts on this year's Welsh budget is just meaningless scaremongering. Leanne and her pals are making it up as they go along because simply put there is nothing on the table as yet. And why do we have to make cuts or for that matter provide the stable government that the country needs? Because Labour have made such a mess of the economy and when it came to putting together a progrssive alternative they walked away. 3.A comprehensive green agenda in which we will penalise polluters and encourage and reward those who care for our environment. 4. Cleaning up politics including a fully elected House of Lords, a referendum on the voting system so as to make it fairer and the ability to sack corrupt MPs. The abolition of ID cards and the National ID database and the ending of the detention of children who are seeking asylum. Leanne Wood may contend that we have sold out but we did exactly what her party did in 2007. We compromised with our biggest enemy so as to do the responsible thing and bring stable government to our country. How many of her party's core policies were abandoned once they were in government? Quite a few including PR for local government and tuition fees where they did not just go against their manifesto commitment but also the partnership agreement itself. We were not squirming in the Senedd last week we were robustly defending that deal against the lies and misinformation being put about Labour and Plaid Cymru, both of whom have embraced the sort of opportunism Leanne accuses us of. They see an opportunity and they are going to try and take it. Otherwise why would both Plaid Cymru and Labour actively encourage defections from the Liberal Democrats to their parties? They have nothing to offer us. They are both deeply illiberal and between them they have failed us in government. Their embracing of the so-called 'left wing' agenda is a sham. They like to talk the talk but when it comes to being in power they adopt the same pragmatism of every other government. My advice to Leanne and the rest of the so-called left is to calm down. Stop making things up and judge us on our record. No doubt we will make mistakes, we will do things that I and others disagree with but we have taken on the responsibility of trying to put right the mess created by the last government and so far at least 60% of the electorate respect us for that. I have blogged many times on the threats to our civil liberties and privacy posed by Government and consequently I am delighted that the new Coalition Government is pledged to end the ID card scheme and the National ID database that goes with it. However, as this article reveals it is not just government that poses these sorts of threats. The companies who provide the on-line services we use every day can be just as culpable. "The admission, made in an official blog post by Alan Eustace, Google’s engineering chief, comes a month after regulators in Europe started asking the search giant pointed questions about Street View, the layer of real-world photographs accessible from Google Maps. Regulators wanted to know what data Google collected as its camera-laden cars methodically trolled through neighborhoods, and what Google did with that data. Facebook is currently engaged in a heated debate with its 400 million members about its shifting privacy guidelines, while Google has had to contend with other privacy missteps, like the introduction of its Buzz social network earlier this year that publicly exposed people’s closest e-mail contacts without permission." Whilst the legal fall out of this admission works it way through the system it is worth thinking about what information we each make available in this way and whether we are comfortable about other people possibly having access to it. This morning's Daily Telegraph reports that the government's emergency budget later in the summer will put the first plank of the coalition agreement in place by implementing the Liberal Democrat policy of raising the tax threshold for the low paid. They say that the tax-free personal allowance will be raised by at least £700 to more than £7,000, a move that will benefit an estimated 25 million lower-paid workers and pensioners. The income tax cut is to be introduced from next April. The personal allowance could rise by even more if extra money is collected from an increase in capital gains tax. They add though that the Treasury is expected to alter the tax thresholds to ensure that higher-rate taxpayers — those earning more than about £40,000 — will not benefit from the increased allowance. They say that taking the income tax cut and National Insurance rise together, someone earning £10,000 will be £254 better off while someone earning £20,000 will save £154 in tax. But someone earning £50,000 will pay £286 more in tax from next year and someone on £100,000 will pay an extra £786. An interesting redistribution of tax that clearly shows all the hallmarks of Liberal Democrat influence on the Tories. Just for a change today I thought I would leave the new Liberal Democrat-Conservative Coalition Government to one side and talk about Plaid Cymru. This morning's Western Mail reports that remarkably little interest is being shown in the election for Plaid Cymru’s top two officials. It seems that nominations close at the end of the month for the posts of leader and president and yet most of the possible contenders in the party were not aware of this fact. Who knew that the Western Mail's Martin Shipton kept a diary of such events? Perhaps he would like to remind me of key birthdays and anniversaries, something I always forget to do anything about until the last minute. It would perhaps be unfair to suggest that after Plaid Cymru's disastrous performance in last week's General Election that it is not surprising nobody else wants to take on the top jobs. After all they were beaten by the BNP in both Newport seats, came fourth in two of their target seats and actually fell back significantly in two others. However, the real reason is most probably due to the fact that they are in government and less than a year away from an Assembly election. Nobody wants to upset the apple cart in such circumstances and I don't blame them. Mind you, if Adam Price gets elected to the Assembly next year all bets are off. Why were Labour not serious about the progressive alliance? This morning's Western Mail reports that a deep split within Labour scuppered any post-election deal with the Liberal Democrats and consigned them to a period in opposition. This is confirmed by Plaid Cymru who complain that the “tribal loyalties” of some Labour MPs had undermined the possibility of an anti-Conservative government. Despite that Peter Hain was on Radio Wales this morning spinning the line that it was the Liberal Democrats who had walked away from these talks. The fact is it was Labour Party who were not interested in a progressive alliance of the left. They were not prepared to make any concessions on fairer taxation, extra early years funding for poorer children and political reform. A decision that made the Conservative-Liberal Democrat coalition inevitable. Nick Clegg and the Liberal Democrats have entered government on the basis of principle and after securing major concessions on all their four priorities. My understanding is that we have got the agreement of the Conservatives to raise the income tax threshold to £10,000 taking 222,400 people in Wales out of tax altogether, whilst 839,280 taxpayers will be £700 a year better off. We have also secured billions of pounds extra for education, targeted at the poorest pupils, a commitment to link the old age pension to earnings, a fixed term Parliament, no more finger printing of children, and substantial concessions on civil liberties and the green agenda. This is not a Conservative government it is one in which the Liberal Democrats will play a major role in moderating the more extreme policies of the Tories whilst putting many aspects of our own agenda into place. Obviously, I have not yet seen the full policy document or the impact it will have on Wales but so far the only conclusion that can be drawn is this is a good day for the United Kingdom. There are a lot of outraged Tories around at the moment. Some of them have even reverted to calling my party 'Liberals'. However, if the insight provided by Polly Toynbee in today's Guardian is anything to go by David Cameron has nothing to worry about. Talking to some high-ups on the progressive wing of the Lib Dems, they worry that some the Labour chief negotiators are just going through the motions while putting serious obstacles in the way. They fear many in Labour agree with the neanderthal tendency represented by David Blunkett – no deal is better than giving true proportional representation to the Lib Dems. This is odd and unexpected: they say Lords Mandelson and Adonis are extraordinarily positive and willing to give most things on the radical Lib Dem agenda. Surprisingly it is those you might think on the left – Harriet Harman, Ed Miliband and Ed Balls who are foot-dragging. This team of negotiators claim Labour can't guarantee to get real PR through the party and none seem keen on it anyway. Their attitude, say my informants, is far from welcoming. The suspicion is they would prefer to sit on the opposition bench and watch the Lib Dems be slaughtered by tying themselves to the Conservatives. She says that if the Labour team really is trying to make a deal impossible, they are making a historic mistake: Worse, they are betraying the people they stand for – every pensioner and poor family who always stand better protected by a left of centre government – however difficult that may be to construct. Is Labour's fatal fascination for a quiet life of internal debate (or strife) on the opposition benches getting the better of them? They should remember there is no guarantee they wouldn't be out of power for a long time, but the call of the wild is never far from their tribal instincts. I have said on a number of occasions that this so-called progressive coalition is a non-starter simply because it would not have the numbers to make an impact and because many Labour MPs would revolt against passing a referendum on the Alternative Vote system of voting for Westminster. It may well be that the last 24 hours has been all about Nick Clegg demonstrating this basic fact to his MPs but who would have thought that we might now have Labour MPs actually advocating handing Government over to the Tories? So much for their anti-Cameron rhetoric during the election. Last night’s two-hour meeting of the Lib Dem MPs (with a sprinkling of peers) seems to have swung the party decisively behind a Lib-Con coalition deal. An announcement is widely expected now today. There are last-minute talks going on between Labour and the Lib Dems right now but that was not the deal that the Lib Dem leader and his negotiating team were steering the party towards last night. Danny Alexander told MPs that the Labour negotiating team (or more precisely one half of it – the two Eds, Miliband and Balls) were not giving off good vibes. The whole body language of the Labour parliamentary party was bad. Ministers were knackered and most had already disengaged from their jobs. These opening addresses changed the mood music from the afternoon meeting. The march towards a formal coalition between the Conservativees and the Liberal Democrats now seems unstoppable. However, Nick Clegg still has a big job to do in getting it through his party. Not enough attention has been paid to selling the deal to activists out in the country, whilst MPs appear also to be in need of further convincing. The party leadership may be doing the right thing but they should not forget that they have to take others will them if they are going to seal the deal. Having been through two sets of talks to form coalitions I can appreciate the way that the Liberal Democrats at a Westminster level have learnt from the experiences of both Wales and Scotland. The first rule of course is not to negotiate in public. If you do that then you will not achieve anything as vested interests take over. The second rule is to keep your options open so as to strengthen your negotiating hand. Alas that is one tactic that was not adopted by the Welsh Liberal Democrats back in 2007. It looks like Nick Clegg understands where we went wrong. I suspect that the observance of the first convention is one reason why activists in both the Conservative Party and the Liberal Democrats are increasingly agitating over red lines which they do not wish their respective party to cross. In this morning's Independent the inevitable speculation, based on rumour, innuendo and the briefings of lobbying members suggests that meetings have ended in deadlock and that pressure is growing to find common ground on electoral reform. Despite that though talks continue to go on. The problem it seems to me is two-fold. The media are not used to this sort of deal-making and want instant-results. They are not going to get them. Coalition building takes time and for a third party in particular there needs to be a sufficient amount of their core policies and principles in the final document to be able to sell it to their activists, members and voters. Secondly, the lack of information is causing a huge amount of anxiety amongst the members of both parties that they will be sold-out in some way. Despite what I have written previously about stability and responsible government being our number one concern, I too want to see some progress being made on Liberal Democrat hobby horses such as fair voting come out of these talks. This is fundamental to our pitch for a fair society and forms part of our agenda to clean up politics. As I have said, I do not believe that we are strong enough to get everything we want but I would expect some substantial progress. It is for this reason that we should not be rushed by anybody into making a deal. It seems that the markets this morning have not crashed as some predicted. Indeed they appear to be taking comfort from the fact that these talks are offering stable government. The imperative now must be for the Liberal Democrat negotiators to get the best deal they possibly can and for us to give them the room in which to work. I have no great insight on the talks going on in London at the moment other than what I am seeing on the media and the fairly bland e-mails I am receiving from the Liberal Democrat Party President, Ros Scott. These e-mails basically say 'don't panic, don't comment and don't jump to conclusions'. That is about right. There is also a huge amount of expectation and quite a few threats on social media sites of resignation and betrayal if electoral reform does not form part of any package. To those people I would say read the advice from Ros Scott. Nothing has yet been agreed, there is no proposal on the table and we have to be patient. Much as I want to see electoral reform these talks are about bigger issues. On their outcome lies the future of this country. It is incumbent on Liberal Democrats to put the national interest first and to deliver stable government. If we cannot do that then our case for electoral reform will go out of the window. Gordon Brown is dangling a referendum in front of us but he cannot deliver. The sort of coalition of losers he is promoting would be unstable and would not deliver electoral reform because the outgoing Prime Minister could not deliver his own Parliamentary Party. Meanwhile Plaid Cymru and the SNP continue to promote their own fantasy of delivering a left-of-centre UK Government when the reality is that nobody wants to talk to them and they remain as irrelevant as ever. That may change of course but I think it is unlikely. I do not know whether the current talks will produce a coalition government, a confidence and supply agreement or something else. I do not know whether we will get a referendum on electoral reform or not. What I do know is that voters expect us to sort out the economy, secure the future of this country and make necessary changes that will make the system fairer. That may mean that we get less than electoral reform but will still be able to take a significant step forward. Great political and social change does not often happen overnight. However, if we get it right in these talks we will have prepared the ground for irreversible constitutional change and that must be in the best interests of this country. There is a fascinating article in today's Independent that underlines just how weak Cameron's position is within his own party and why his ability to get his feet under the table in 10 Downing Street is key to his survival as Tory Leader. Michael Brown says that this is a pyrrhic Tory victory: In the words of one senior Tory backbencher to me yesterday, "Cameron has pissed this election away." The Tory leader has spent more than four years "decontaminating the brand". Yet, against this backcloth of humiliation for Labour, he has ended up with less than a 3 per cent increase on the share of the vote achieved at the 2005 general election by Michael Howard, who pursued a "dog whistle" campaign highlighting, immigration, Europe and tax cuts. This result is a recipe for Tory backbench recriminations that could poison Mr Cameron's putative premiership from the start. Particular embarrassing for the leadership were the heavy defeats for the likes of Shaun Bailey, the black candidate in Hammersmith; Joanne Cash the über Cameroon, who described her party workers in Westminster North as "dinosaurs"; and Mark Coote, the openly gay candidate in Cheltenham. These three were the poster boys and girl for the "modernisation" campaign that consumed Mr Cameron's energies when he could have been formulating coherent policies to address the economic crisis and the national deficit. Most, though not all, Tory backbenchers, whether friend or foe of the party leader, would rather be in government than in opposition – but not at any price, and certainly not (wrongly in my view) at the price of sacrificing the first-past-the-post electoral system. This will tie the Tory leader's hands in any discussions he may have with Nick Clegg. The Tory blogger Iain Dale has suggested that Mr Cameron could offer Mr Clegg legislation on a referendum for PR – and then promptly campaign for a "no" vote. Somehow, I suspect such Machiavellian tactics would cause mayhem in the Tory ranks. Should he cross the threshold of No 10, Mr Cameron will face as many nightmares from behind him as he will from the parties ranged opposite him. He will be under pressure to dispense with the "voodoo advisers", led by Steve Hilton, who have sought to control and sideline backbench MPs, parliamentary candidates and the party membership. As Harold Wilson recognised throughout his minority government premierships, the only place that now matters is the House of Commons and the parliamentary arithmetic. The consolation is apparently that the power of the executive will diminished giving more power to backbenchers. That must be a good thing. It is far too early to be drawing conclusions about yesterday's General Election and I am not about to do so, although I do have a short debate on Wednesday on the need for constitutional reform. Nick Clegg has just made a statement outside 4 Cowley Street in which he has acknowledged that the Conservatives secured the most votes and the most seats and that therefore it is up to them to prove that they are capable of running the country in the public interest. I believe that he is absolutely right to have said this. In doing so he has avoided the mess that Jeremy Thorpe made of a similar situation in February 1974, talking to a discredited and rejected Prime Minister when it was clearly contrary to the national interest, public will and the mathematics of the House of Commons chamber. What must be clear is that this is not a blank cheque for David Cameron to implement his manifesto. He does not have majority support amongst the public for that. If he is to govern, either as a minority or as part of some other arrangement he must compromise and listen to the clamour for a fair approach to politics, the economy and the need for constitutional reform. How this develops is up to the Westminster politicians. The one thing they must not do is to allow the media to dictate the pace of talks to them. The time for that is past. Now we must reflect and act to get things right, no matter how long it takes. I am just about to set off to deliver the first polling day leaflets. It is barely light outside and I have had only a few hours sleep. I am not expecting to be get back to my bed for at least another 24 hours. This has been the most extraordinary election and it is not over yet. It is possible that we are on the verge of a tremendous change in the way our country is governed. Every vote will count. I hope that I will not be disappointed. I have just asked a question of the Rural Affairs Minister about the imminent badger cull in North Pembrokeshire. I was particularly concerned about the Cilgerran Wildlife Centre which includes amongst its activities families watching badgers in their natural environment. The Wildlife Trust of South and West Wales, who own this centre have had notice that they are included in the cull area and that the badgers on their property will be trapped and shot. I asked whether there was a compromise that might be put in place here to test these badgers rather than destroy them so as to preserve the sanctity of the wildlife centre. Unfortunately the Minister was having none of it. She was very clear that these badgers form part of the 'resevoir of disease' in the area and could not be excluded from the measures she has put in place. This was despite not having any evidence to back up this assertion. This is complete nonsense of course. Both the Welsh Government and the Police Authority are public bodies, whose proceedings, budgets and actions are meant to be open to scrutiny. I was not asking for operational details only the additional sums of money being given to the police over and above their existing resources. What they are saying therefore is that in addition to the £9 million that is being spent on culling badgers the Labour-Plaid Cymru Government has signed a blank cheque for the Police Authority to help manage the slaughter. It is right of course that any protest is lawful and non-violent but it is also essential that when a democratically elected government embarks on a course of action then their decisions are open and transparent and subject to full scrutiny. That is something that Labour and Plaid Cymru have avoided at this time on this issue. The prominence given to Cowell's thoughts has left the pound teetering on the brink of total and irreversible collapse as the White House made an urgent call for Britain to be suspended from Nato and the country's permanent seat in the UN Security Council handed to Robert Mugabe. Fresh from trying to compare its own poll to a previous one by ITV Wales, despite the fact that they were done by different companies, had different methodology and sampled different numbers of people in different parts of Wales, the Western Mail publishes another unbelieveable claim this morning. It is one of many in this election and nearly all of them have rested on an incomplete understanding of statistical analysis. In other words opinion polls are a dangerous tool in the hands of the media, who use them to make the most bizarre assertions and often misinterpret them to fit their own message. The YouGov poll for ITV Wales shows a 7% swing from Labour to the Conservatives since the last election in 2005. If such a swing were replicated across the rest of Britain, the result would be right on the borderline between a hung parliament and an overall Tory victory. Really? It is an attempt to pass off an orange as a pear. The Western Mail are using a poll confined to Welsh constituencies to project outcomes across the rest of the UK. If that sort of comparision were sustainable then Labour would be heading for a majority government and Plaid Cymru would be set to make gains in the Home Counties. What absolute nonsense. If the papers are to be believed the election is virtually in the bag for Cameron. Today's Daily Telegraph proclaims that the Tory leader needs just 14 more seats for outright victory. This on the basis of a poll of Labour-Conservative marginals. The problem with these sort of projections is that even in a poll of marginals we do not get uniform swings. There will be huge regional variations and even differences within regions. Seat projections in these circumstances amount to guesswork. Cameron is actually not much higher in the polls than Michael Howard in 2005. The only thing certain about all of these predictions is that this contest is not over yet and that Cameron should not start measuring for curtains in Number 10 yet. Shadow ministers have criticised the guidelines drawn up under the supervision of the cabinet secretary, Sir Gus O'Donnell. The Tories accused O'Donnell of overstepping his constitutional authority by giving his blessing to a delay in the return of parliament to allow talks on a coalition in the event of a close poll result. David Cameron was not consulted on the changes which will mean that the Queen's Speech will not be held until 25 May – 19 days after the election. In 2005 the Queen's speech was held 12 days after polling day. MPs will return on 18 May to elect the Speaker, 12 days after the election. In 2005 there was a six-day gap. Senior shadow ministers are making it clear that Cameron, who intends to lead a minority government if the Tories fail to win a parliamentary majority, is prepared to ignore the rules. These are designed to allow for a week of discussions between the party leaders on forming a coalition. Senior Tories believe Cameron will require political momentum if he wins the largest number of votes but falls short of an outright majority. Allowing Brown to remain in office for a week could check that momentum. The Queen does not summon a prime minister to resign; convention dictates that is for the prime minister to tender his or her resignation. Cameron indicated yesterday that he is prepared to challenge this convention. The Tories fear Brown will use the new rules to follow the example of Edward Heath, who tried to hang on after the February 1974 election to broker a deal with the Liberal party. Heath, who won the most votes but secured four fewer seats than Labour, resigned four days after the election, after the talks broke down. Whatever the rights or wrongs of this course of action the fact that there are no agreed conventions on how to proceed in the event of a hung Parliament does give rise for concern. It is not like a Tory to stand up to the monarchy in this way and I would be sceptical as to whether Cameron would go ahead and do this anyway, but surely he must see that this just adds to the case for reform of our political system. If he does not then the change he claims to represent is no change at all. It is business as usual and that goes against the mood of the public. Speculation is growing as to the future of the Tory Shadow Secretary of State for Wales, Cheryl Gillan following her party’s decision not to field her in the BBC’s Welsh leaders’ debate. Nick Bourne, the Opposition leader at the National Assembly, appeared in Sunday evening’s debate instead. Guardian journalist Nick Watts, who has good sources in David Cameron’s circle, described Ms Gillan as one of four “plodders” in the Shadow Cabinet whose performance was not rated highly by the leader, but who was regarded as a hard worker. If David Cameron does form a government he may well want to look elsewhere for a Secretary of State for Wales, preferably one who represents a constituency in Wales. If the Tories succeed in taking Cardiff North then he may not want to look much further than Jonathan Evans, a former Minister and MEP hoping to make a return to Parliament. It goes without saying that our tips are almost certain to be worthless duds. Please do not try this at home or at work unless you’re looking to give money away. Vince visits: If Cable is in town, you know the Libs see an opportunity. They are usually not as sure fire as Clegg visits, but potentially better value bets. I’ve put my money on Lib Dem wins in Ashfield at 5/2 and Redcar at 7/4. Tory weak spots: The Tories are on the defensive on some seats where they had been pretty confident of winning with an increased majority. Some Tory MPs face expenses problems (Eastbourne) others are just unused to dealing with a Lib Dem onslaught. I’ve taken Wells at 7/5 and Weston-Super-Mare at 7/4. Newcastle Sweep: The Lib Dems are polling exceptionally well in the North East. There are hopes of winning two to three seats in Newcastle. Labour will face an uphill task turning out their vote. My bets: Newcastle Central at 2/1 and Newcastle East at 13/8. Long shots: Vulnerable. But will require a big Lib Dem surge. Purely based on some insider tips. Fully expect them to be over-optimistic punts. But these are probably the most generously priced Lib Dem seats around. The bets: Woking at 6/1 and Mid Sussex at 6/1. I suppose like everybody else Mr. Barker will have to wait until the early hours of Friday morning to see how the country has actually voted. What's occurrin' - the final week! On my way out to rejoin the campaign trail so here are a few gems from this morning's papers. The Guardian reports that a high-flying prospective Conservative MP, credited with shaping many of the party's social policies, founded a church that tried to "cure" homosexuals by driving out their "demons" through prayer. What next? Another problem for Cameron as he tries to reposition his party as modern and outward looking. Whatever happened to his talk about the 'Big Society'? Clearly, Tory society is not as big as he would like. Meanwhile, the Mail on Sunday reports on the aftermath of 'bigotgate', carrying an exclusive interview with Gillian Duffy. Nor was Mrs Duffy impressed when he came to her house, made a grovelling apology and invited her to No10 to visit him and his wife Sarah. ‘He asked, “Do you ever come down to London? If you ever come down you must come to No. 10 and meet me and Sarah,”’ Mrs Duffy revealed. ‘Well, I just looked at him. I didn’t like to say it, but all I could think was, “I don’t think you’ll be there.”’ Well, yes! Later, Borthwick, 38, said he was not a member of any opposition party, and had merely wanted to highlight that the prime minister was talking only to party activists rather than the general public. The problem is that when Gordon does get to meet real people like Gillian Duffy, he insults them. The Observer has joined the Guardian (and apparently Scotland on Sunday) in coming out for the Liberal Democrats. They say that private polling has indicated that several seats not previously on the party's hit list are now within the Liberal Democrats' grasp. Examples include the Labour-held stronghold of Redcar in north Yorkshire, Labour-held Colne Valley in west Yorkshire and the Tory-held seat of Wells in Somerset. Party strategists claimed their policy of "tax fairness" – under which the first £10,000 of earnings would be exempted from income tax – was swaying an increasing number of floating voters. A survey released last week by Opinionpanel showed that the percentage of students planning to vote Lib Dem had almost doubled over the course of the campaign to 50%. Since Clegg's performance in the first televised leaders' debate, the party's national student organisation, Liberal Youth, has reported "tenfold" increases in volunteering and pledges of support. Seats that the party could win off the back of student support include York Outer and Oxford East. Leicester South and City of Durham also now seem to be within Clegg's grasp. You can add Swansea West to that list as well especially with the news in today's Sunday Times that students are facing rises of up to £1,000 a year in tuition fees under plans being drawn up by an official review that could eventually allow universities to charge the full cost of a degree. Lord Browne, the former chief executive of BP, wants to remove the current £3,225 limit on fees. Leading research universities could charge students an estimated £7,000 a year while fees for science undergraduates could rise to £14,000. The Liberal Democrats' policy to phase out tuition fees over six years has never been so relevant.